Symposium attendees represented ORNL, the University of Arizona, Georgia Tech, the University of Tennessee-Knoxville, and Brigham Young University. January 22, 2019 – Quantum experts from across government and academia descended on Oak Ridge National Laboratory on Wednesday, January 16 for the lab’s first-ever Quantum Networking Symposium. 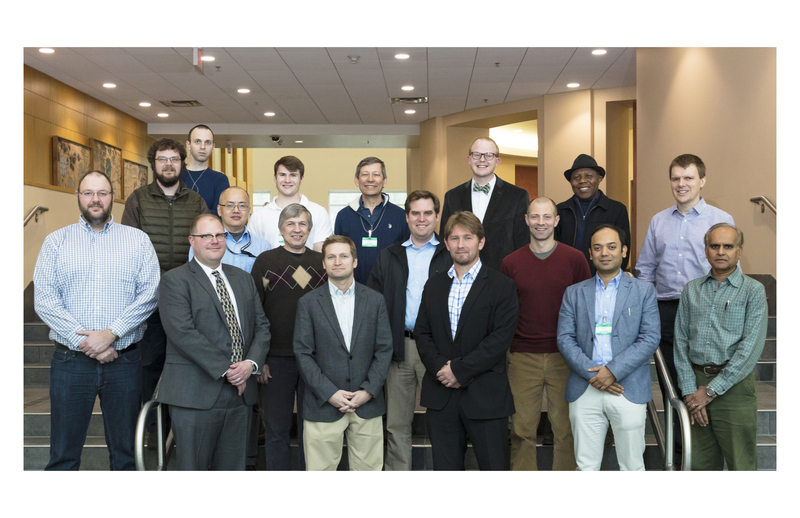 The symposium’s purpose, said organizer and ORNL senior scientist Nick Peters, was to gather quantum and classical networking expertise to better strategize and align capabilities with the nation’s needs. The one-day event featured talks from several ORNL researchers Raphael Pooser, Pavel Lougovski, Nagi Rao, Phil Evans, Joe Lukens, Bing Qi, Travis Humble, and Brian Williams. In addition, the University of Arizona’s Saikat Guha, Georgia Tech’s Rob Clark, The University of Tennessee-Knoxville’s Eleftherios Moschandreou, and Brigham Young’s Ryan Camacho gave talks on various aspects of quantum networking, from components such as integrated optics and ion traps to larger fiber optical networks used for quantum secure communications. “We have brought together scientists with expertise in the crucial areas which need to progress and interoperate for quantum networks to become a reality,” said Peters, who also leads ORNL’s Quantum Communications Team. ORNL was chosen as the setting for the symposium due to its decades of experience in photonic entanglement, quantum communications, quantum networking and quantum key distribution. Because quantum research is inherently interdisciplinary, the laboratory has extensive expertise distributed throughout its various scientific groups, in addition to a concentration within the quantum information science group where the core quantum communications team resides. The distribution of staff and expertise encourages a culture of deep collaboration centered around the lab’s core group. In addition, ORNL collaborates with academia, industry, utilities, and other national labs to foster innovation across the quantum spectrum, from computing to materials. The laboratory’s externally funded quantum-based cyber security research dates back to 2011, and the lab’s Directed Research and Development Program has made significant investments before and since. More information on ORNL’s quantum information science research group can be found at https://www.ornl.gov/division/csed/quantum-information.